Flood Panel LLC now provides flood mitigation systems nationwide and off-shore; we have developed a certified installer network* for exclusive installation of our flood mitigation products. These installers* are typically licensed contractors with years of experience, OSHA certification and insurance. All of our installs are now handled by these certified companies*. Flood Panel LLC can provide on-site consulting services during the design phase, and during installation at a fee. Architecture Metals handles all manufacturing, engineering, shop drawings, signed and sealed shops and stamped calculations along with product testing through an independent testing lab. Our terms and conditions cover the materials provided by AM. The installation will be handled by one of our certified installer companies*. *If you would like more information about qualified license contractors in your area, please click here to contact us. If you are a general contractor and would like to inquire about becoming a qualified licensed contractor for Flood Panel installation and maintenance, please click here. 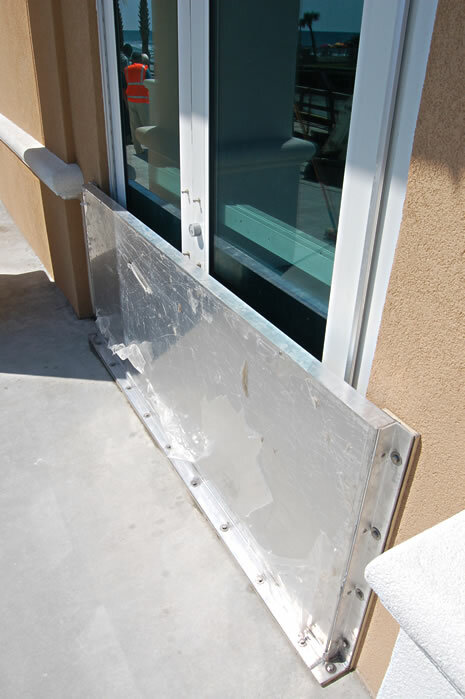 The aluminum Flood Panel™ supplied for your project are flood barriers that will last for the life of your buildings if properly installed and maintained. However, there are certain things you should bear in mind concerning their proper care, storage and handling. The Flood Panel is deployed when an impending storm is threatening the area. When it is time to install the barriers, time is of the essence and proper storage of the barriers will greatly aid in the speedy deployment and installation of the flood barriers. Flood Panel requires very little annual maintenance, mostly to replace foam gaskets and seals, but requires professional supervision and inspection to insure they’re ready for deployment. 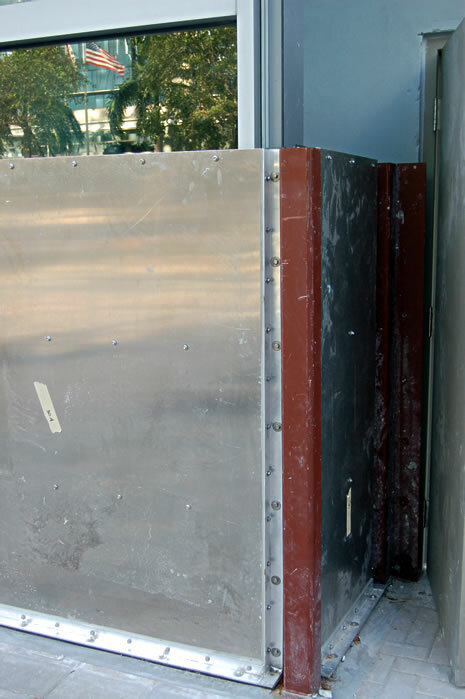 Flood shields, barriers, panels, and closures, to ensure that they fit properly and that the gaskets and seals are in good working order, properly labeled, and stored as indicated in the Flood Emergency Operation Plan. Walls and wall penetrations, for cracks and potential leaks. Levees and berms, for excessive vegetative growth, cracks, or leaks. Mechanical equipment such as sump pumps and generators. Both the Flood Emergency Operation Plan and the Inspection and Maintenance Plan are necessary at the time that the Non-Residential Flood proofing Certificate is submitted to the community. 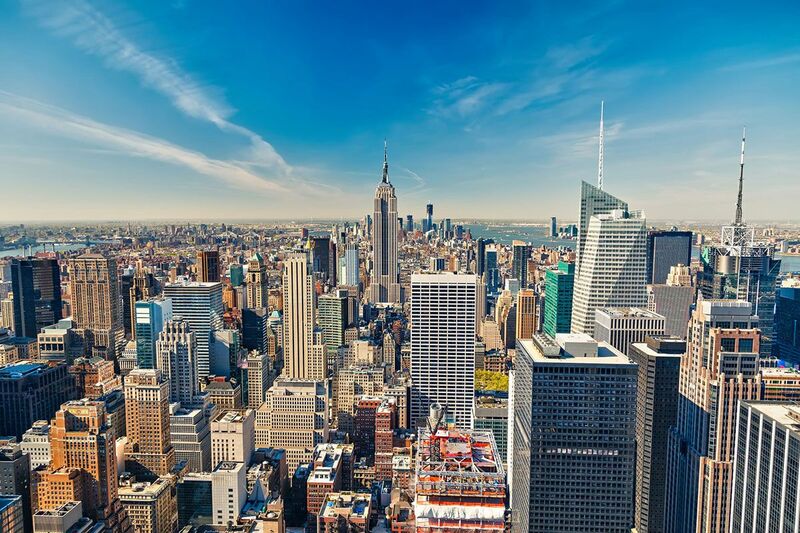 Before issuing a building permit, the community should require that the property owner sign an agreement stating that the plan will be adhered to. The community should also be assured that the inspection and maintenance activities required by the plan will continue regardless of changes in the ownership of the flood proofed building. This assurance should be accomplished by appropriate deed restrictions. Any lease agreement should also contain clear language stating the leaseholder’s responsibilities for the flood proofed building. 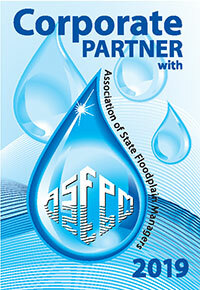 Please contact us to obtain expert advice for your flood protection panels, shields, and barriers.